Moody’s rated the oil giant at A1, while Fitch assigned it A+, both with stable outlook. The state-owned company has the same rating as the sovereign from both Moody’s and Fitch. Aramco has mandated banks to hold a roadshow for dollar-denominated notes from April 1, according to a person familiar with the matter. The company picked JPMorgan Chase & Co., Morgan Stanley, Citigroup Inc., Goldman Sachs Group Inc., HSBC Holdings and NCB Capital to manage the offering. Investor meetings will be held in London, New York, Boston, Singapore, Hong Kong, Tokyo, Los Angeles and Chicago. Proceeds from the sale, which Saudi Energy Minister Khalid Al-Falih said in January could raise about $10 billion, will be used to help fund its purchase of a 70 percent stake in Saudi Basic Industries Corp. 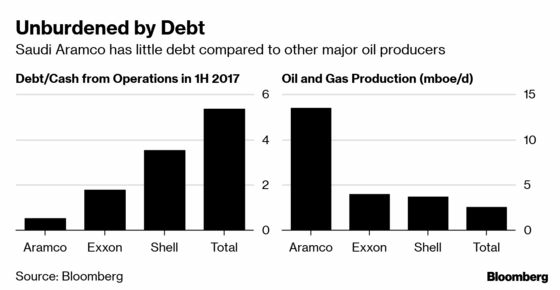 The offering forces Aramco to disclose its accounts to investors for the first time since its nationalization about four decades ago. It’s also a precursor to even greater transparency required for its initial public offering, planned for 2021. Fitch’s A+ rating for Aramco is one level below the AA- for both Royal Dutch Shell Plc and Total SA. Exxon Mobil Corp. has a top Aaa rating from Moody’s and the second-highest at AA+ from S&P Global Ratings. The Saudi oil producer follows state-owned Abu Dhabi National Oil Co., which got a AA long-term credit rating at Fitch in February. Adnoc’s standalone rating was AA+, Fitch said.